During the IARU Region 2 Executive Committee held in Santo Domingo, Dominican Republic, on November 19 and 20, our host Radio Club Dominicano (RCD) organized an event in which we had the chance to award several of the Dominican radio amateurs who participated as emergency communication volunteers in Haiti after the earthquake of January 2010. On the lower left photo IARU Region 2 President Reinaldo Leandro, YV5AM, awards Miltides Leonel Ferrera Pérez, M.D., HI5MFP, who heard on his radio about the RCD caravan to Port Au Prince and immediately joined staying in Haiti as a volunteer for one month. On the right side of the same photo RCD President Hugo Ramón Sánchez, HI8VRS, observes. On the lower right photo IARU R2 President, on the left, presents a plaque to RCD President. 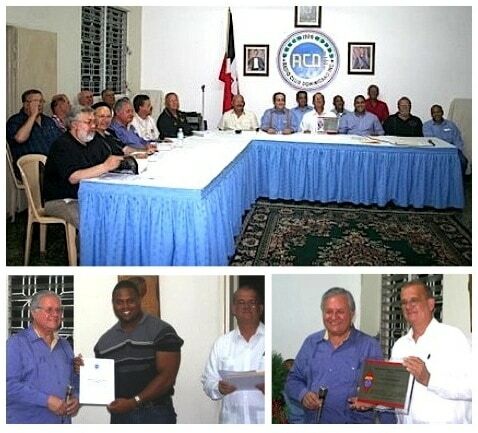 IARU Region 2 congratulates Radio Club Dominicano for its hard work promoting amateur radio in the Dominican Republic.